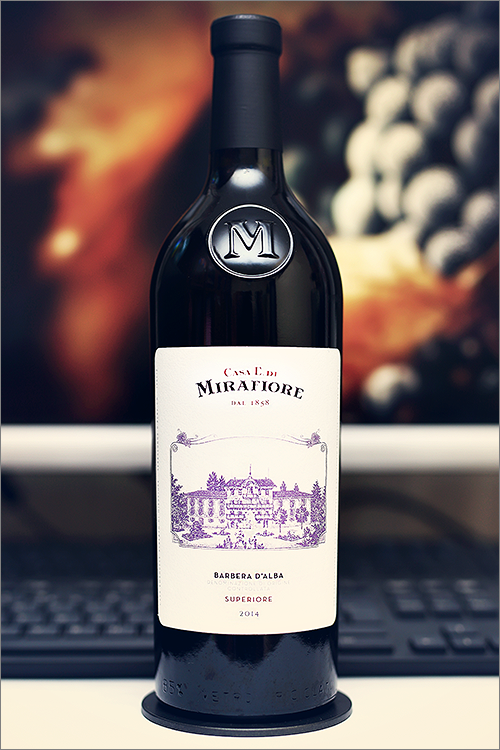 Tonight we are going to review a wine that is considered a pioneer of his generation, un italiano vero from Piedmont – Barbera D’Alba Superiore 2014 by Casa E. di Mirafiore. This wine has antique and royal origins, as it is related to Emanuele Alberto, Count of Mirafiore, the legitimate son of King Vittorio Emanuele II and Rosa Vercellana. The Count of Mirafiore was the first to have the idea of transforming his farm into a winemaking house, the result was a line of extremely high quality wines that were inspired by the great tradition of Piedmonte. The wine we are reviewing tonight is a single varietal barbera wine, that expresses the fusion of tradition with modern winemaking. But let’s not put too much emphasis on the theory – on to the tasting! Deep noble garnet color, with elegant ruby shades towards the rim of the glass. The nose is strong, filled mostly with red fruits and spice: ripe sour cherry, cranberry, sweet cherry, redcurrant, wildberry, ripe red plum, cherry tree wood, dried oakwood, nutmeg, dried cranberry and dried red cherry. An instant later the nose is filled with noble and elegant notes of cinnamon, red pepper, anise, cherry seeds, tobacco and some velvety hints of leather. The wine is dry, with high alcohol level, high acidity and ripe tannin. It feels firm, bold and expressive, with a quite complex body and a nuanced fruity and tannic accent. This is a velvety, elegant and noble wine, which has a nuanced old-world profile with very subtle hints of wood. The wine has a good overall balance and it feels seedy and refined, with an appealing spiciness on the palate. It has a long finish and a balanced, bitter-seedy aftertaste. This is definitely a great Wine of Italy and the overall rating says the same, with 92.3 points scored it is right there, among the best wines we’ve tasted so far. Please click on the chart icon on the left in order to get to the wine rating page, where you can find all the wines we’ve tasted to date. Conclusion: this is definitely a great wine in its prime form – expressive, fruity-tannic and elegant – a wine that can still resist another 3 to 5 years of bottle ageing. It has been aged for 12 months in large oak barrels and at least 6 more months in the bottle before being released, therefore the wine is ready to be uncorked. This is a full and strong barbera wine with a quite warm finish, which translates into a balsamic and seedy aftertaste. For the best experience, we recommend to pair this wine with typical Piedmontese gastronomy, like for example some ‘carne cruda all’albese con tartufi neri’ which is a tartare steak with black truffles or some tagliatelle with black truffles. Salut!